An ulcer is an open sore in the skin or mucous membrane that is resistant to healing. This reduced healing is generally due to a decrease in circulation to the area. They can range in severity from a simple erosion of the epidermis to a persistent wound deep enough to expose the underlying tissue, muscle, or even bone. Ulcers are very prone to infection and should always be evaluated by a medical professional. There are many mechanisms that can result in ulcer formation. Trauma to the skin in areas that naturally experience decreased circulation, such as the lower legs, can create an ulcer. Ulcers can be the result of internal medical conditions – any medical condition that results in reduced circulation to an area can cause ulcers to form. 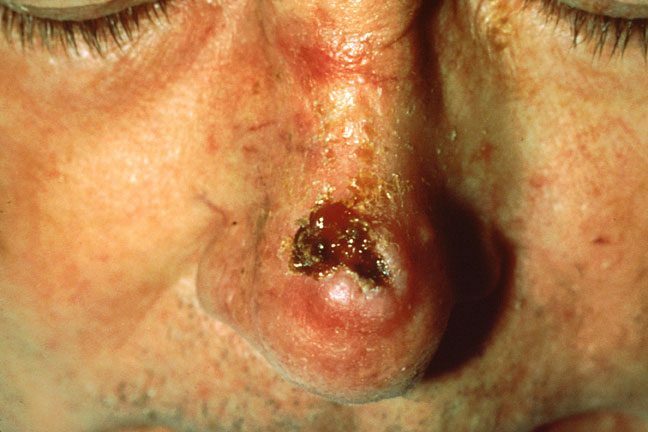 Therefore, some common skin diseases that can result in ulcerations include stasis dermatitis, vasculitis, cancers such as squamous cell carcinoma, basal cell carcinoma, and melanoma, herpes outbreaks, and bacterial infections. 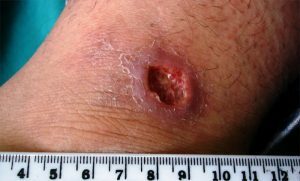 Long-term pressure on an area can create an ulcer known as a bed sore or decubitus ulcer. These tend to occur in people who are somehow incapacitated and made to spend many days in bed or in a wheelchair. The constant pressure caused by laying or sitting in the same position results in reduced blood supply to tissues near bony areas such as the hips, heels, ankles, elbows, back of the head, and tailbone. Persons with type II diabetes are especially prone to developing ulcers on the feet that can lead to serious complications if left untreated. Unfortunately, even with treatment, ulcers are slow to heal. Most treatments involve preventing infection and creating an environment in which the ulcer is allowed to heal. Most important, however, is identifying and resolving the underlying cause of the ulcer. Topical and oral antibiotics and keeping the wound clean can prevent infection while debridement (removal of dead tissue), maintaining a moist environment, and compression can aid the healing process. Ulcers can be a chronic condition and occur more often in persons who smoke cigarettes or are overweight. Contact your dermatologist for evaluation and treatment if you have a sore that is slow to heal.